Apple’s newest firmware, iOS 7, has a lot of new features. 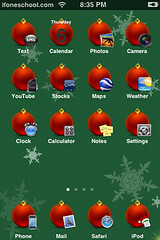 The first thing we are going to look at in detail are the new icon designs and compare them to the old ones from iOS 6. You have to sing the title of the post…it makes it more Christmasy that way!! Well…less then a five days until Christmas…I’m so excited!! I LOVE Christmas! 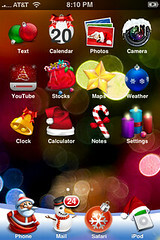 I know, I have already done a post on all the Christmas themes, icons, wallpapers etc. that we have…but, we have accumulated more since then and it is so close to Christmas and I’m feeling all festive…so, I thought i would do it again! YAY!! New icons added! 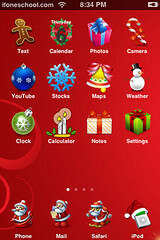 See our Custom Icons page to see all our icons. 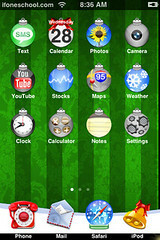 If you would prefer to download a Custom Theme instead of making one yourself…check out our Themes page. Below are some sweet new icons! If you would like to see more icons…check out our Custom Icons page. 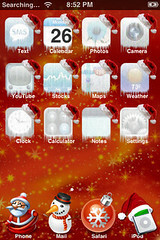 If you would rather not build your own theme but still want your iPhone to be cool…check out our iPhone Themes page! 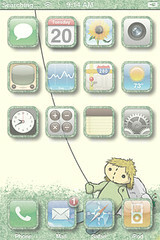 Below are our Featured Themes and Icon Sets…these are themes and icon sets that were either submitted specifically to our site or we have special permission to post them on AppleiPhoneSchool.com. Please be respectful to the designer’s wishes and do not post them on your site unless you have permission from them. Thank you to Kevin Petersen for his LazyDay theme and to Fabiano Confuorto for his Honeycomb theme and the Windows Vista icon set. Below are some sweet new icons! (I’m adding the pink Installer.app icon to my iPhone ASAP!!) If you would like to see more icons…check out our Custom Icons page. 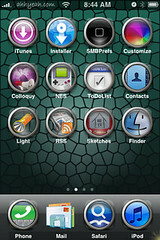 If you would rather not build your own theme but still want your iPhone to be cool…check out our iPhone Themes page! PS. There are about 40 more Mario Party icons I will be adding in the near future! We have added the following icons to our Custom Icons page. 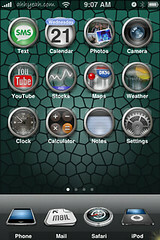 Also check out our Themes page. We have added new icons today to our Custom Icons page. Below are the new icons. 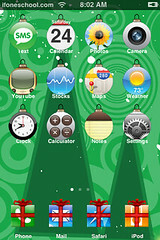 Check out the icons page to see the icons we added yesterday. We would just like to say thank you to “dalethefarmer” for the VERY SWEET new dock icon that he designed for us. It matches a lot better than the screenshot we were previously using to link to our dock page! Keep an eye out for some of his other icons in our Icons page.